At RTA Cabinet store, we offer everything you need to create the perfect bathroom sanctuary you have been dreaming about. We have all the big elements like cabinetry and flooring, as well as those smaller details that truly speak to your design and décor preferences such as sinks, cabinetry hardware, and even the faucets. And since we offer a wide range of exciting bathroom sink options in almost any shape, style, color, and design imaginable, we also offer just the right faucets to round out your bathroom sink area. In addition to a number of different styles and added conveniences available with each faucet, we also offer three beautiful finishes. Chrome Bathroom Faucets » This gleaming, shiny finish is the epitome of modern elegance, perfect for that sleek contemporary look.Chrome finish is chrome plating over brass that is then polished. Chrome has a cooler tone and will not tarnish. Brushed Nickel Bathroom Faucets » The brushed nickel finish is applied with PVD (Physical Vapor Deposition) so it will not chip or flake. PVD is a process that includes a group of vacuum coating techniques used to deposit a thin layer of metal coating over the faucet. This enhances the properties and performance of the faucet material and helps to mask minor scratches that may happen. Oil Rubbed Bronze Bathroom Faucets » Oil rubbed bronze is a chemically darkened surface with deep chocolate or gray coloring and a copper undertone. This darker finish is a nice alternative to the typical silver or gold colored faucets found in most bathrooms. Opting for the oil rubbed bronze finish is a great method for drawing the entire room’s design scheme together flawlessly. Ensure you choose matching cabinetry hardware and towel racks. Bathtub Faucets / Fillers » Luxury freestanding bath-tub faucet to complete a freestanding bathtub installation. Two finishes are available to match the style of your bathroom. 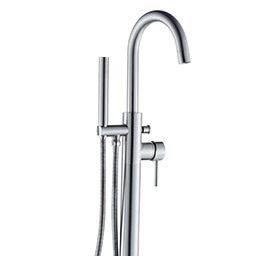 Both models feature brass construction, hand shower and included floor mounting accessories. All of our faucets are drilled from solid brass and contain copper waterways. We use two types of cartridges in our faucets: ceramic discs for single-handle faucets and 1/4 turn washer-less discs for two-handle faucets. Ceramic discs slide over each other to open and shut the spout, which controls water flow and mixes temperatures inside the faucet body. They are high quality and do not need frequent repair, unlike a plastic disc cartridge. A 1/4 turn cartridge also controls the water temperature and pressure, but operates from full-off to full-on in the span of a 90° handle rotation. Glass Waterfall Faucet - For all of our glass vanity sinks, we recommend the Glass Waterfall Faucets, which are available in a variety of designs and colors. Vessel sink faucets are offered for any vanity sink design. In addition to your sinks, we have the entire bathroom covered when it comes to your faucet needs. We offer complete tub and shower sets to ensure a harmonious look throughout your bathroom. Tub Faucets - Our tub faucets are a great compliment to any bathtub. The 6”-24” center set in all tub faucets offer flexibility in installation and the flexible body spray hose provide great coverage area. The tub faucets are available in chrome, brushed nickel and oil rubbed bronze to match any bathroom style. All of our tub faucets are ADA approved. Shower Sets - Our shower sets are all sold with three-pieces; shower head, handle and faucet. Buying a set instead of individual parts ensures that each piece will match and you will not be missing any components. Our shower sets come with a choice of standard multi-spray heads or rainfall spray heads. Each offers a relaxing shower experience, are easy to use and require little-to-no maintenance. The limited temperature stop in each faucet will prevent scalding when water pressure changes. All of our shower sets are ADA approved.